At the Phoenix Society of Historical Swordsmanship, new students come to us frequently. Because we do not have set regime of training, how best to handle these new students is something we have worked on for years. Below are some guidelines on dealing with new students if you do not have 6 week programs, or something like that, but rather, you show up and train and progress. One on One = When a new student arrives we sometimes attach them to a veteran student. The veteran student is asked to lead the new arrival through our 101 class, which takes around 2 hours. The 101 class uses Fiore de Liberi's arts as a means of giving the student a sample of things that we do at the club. In two hours, the student is exposed to source material, then taken through a few plays of wrestling, dagger, sword in one hand, and finally sword in two hands. After that, the student is invited to look around the club and watch the others learn or spar. This method helps train our veteran students. At the Phoenix Society, we want to make our students into teachers. Will everyone do great at it? No. Will mistakes be made? Yes. However, over time, all the students can start teaching others in as little as a month or two depending on their own progress. Within a year, it is not unusual for one of our veteran students to run a section of the class as we split off into teams. The new arrival doesn't know it, but they are training and improving the skills of our veteran students. Sparring = It may seem cruel to throw a new arrival into sparring, but there are some reasons to do this. After a quick lesson on what to do with a given weapon, we sometimes send a new arrival into sparring with the purpose of training the veteran students. The rapier is my favorite to do this with, because the source-material is clear that many did not know how to use the rapier, yet carried them and were still dangerous. The new arrival does not know much about rapier, yet they can be tremendously frustrating for veteran students. It is not unusual for a new arrival to kill or double with someone with years more experience. We use this to teach our veteran students on how to fight someone who is unpredictable and fencing unsafely. It is a skill in of itself, just as there are certain techniques and methods for fighting someone who understands a weapon, there are the same for fighting someone who does not. This is a great place to apply them! It also exposes the new arrival to sparring and they do learn! Most new arrivals, with minor corrections, learn what works and what does not and in so become safer fencers- if not exactly better just yet. That takes time! With single-stick, a new arrival can relatively safely get into sparring, and single-stick is one of the more intuitive systems. They can be taught to parry, cross-cut, strike, or whatever you like quite quickly. While it can take up to a year for a student to really understand how best to use a rapier, we've seen new students become proficient with the single-stick in a month or two. When it comes to the longsword, the new student makes for a fine example of a simple fencer who knows how to cut and thrust, and that is about it. 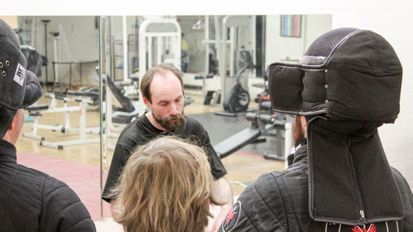 We encourage our veteran students to attempt Fiore's more complicated plays, including those involving grappling. Fiore's art was meant to be taught in secret, and when using it against, not a fellow veteran, but someone who knows little of Fiore- the magic can really be seen! Because the goal is for both the new and veteran to improve, if the veteran student performs a play and defeats the new student, we ask the veteran to explain how they did it, or one of the Phoenix Society's instructors steps in. In this way, the new student spars, gets personal attention to improve, and yet at the same time they allow the veteran students to attempt plays that are harder to perform on someone who is trained in them as well. Giving a Clear View = The above methods are a quick and efficient ways to let new arrivals know what our club is all about. They get one on one attention, learn a technique or two, and get right to the sparring. It can be a lot to take in, but we also find that it lets the student know exactly what a standard day at the Phoenix Society will be like. John and I want anyone who comes to us to learn if the club is the right fit for them or not. If it is, great! We have gear to loan, shirts to sell, dues to collect and so forth, if not, the student can seek out something else and they don't waste their time, or ours. Like this article and others? Be a sponsor! 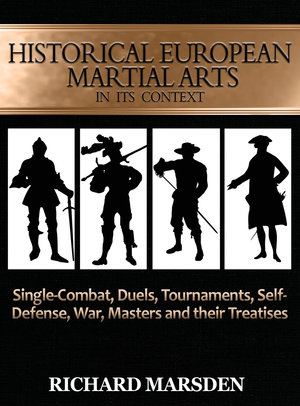 as Historical European Martial Arts in its Context. anecdotes about European martial arts in its context.